Thermal grease is a multi-component plastic substance, high thermal conductivity. When the computer processor heats up to prevent overheating of its lid should fit snugly to the surface of the heat sink radiator. In fact between them are formed of microscopic air voids, creating conditions of poor thermal conductivity. Thermal grease provides contact of these elements, closes the voids and displaces air. - if you increase the operating temperature of the processor. The choice of thermal paste. To make the thermal paste alone is not possible, however, it is sold in all computer stores and service centers. The main characteristic of thermal paste, which you should pay attention first – conductivity. The minimum rate is equal to 0.7 W/(m•K), but this pasta is hardly suitable to the powerful processor. Some manufacturers say the data on thermal conductivity to 10 W/m•K. the Second important indicator of the quality of thermal paste – working temperature. It indicates in which range the paste will retain its stated properties. Another indicator is the density. The higher it is, the more particles included in the thermal paste. Power off the computer if you have a laptop, remove the battery. Also, disconnect all peripherals: keyboard, mouse, stereo, etc. Take apart your laptop (computer) according to the instructions attached to it. Way cooler and a grate cooler of the radiator. Disassemble them using a screwdriver. Remove accumulated dust and the remains of the old thermal paste using regular cotton pads. To remove dirt in hard to reach places will help you with ear sticks. Apply a small amount of new thermal paste on the processor chip. Distribute the paste on the surface of the finger, however, to create the desired layer, about 0.3 mm to need a plastic card. Some manufacturers offer complete with a special compound plates. With a plate you can remove. While the cooling system is disassembled, lubricate the cooler fan engine oil. Remove the old grease with cotton buds. Then use a wooden toothpick drip a few drops of oil. This will reduce friction, enhance cooling performance and reduce the sound of a fan running. It is now necessary to return all into place and close the computer case or laptop. Choosing thermal paste, pay attention to its technical characteristics. More important factors: the thermal conductivity and operating temperature. The higher these numbers the better. Change the thermal compound twice a year to prevent and, as necessary, when the CPU starts to warm up more than usual. The CPU temperature can be measured with specialised software or use the built-in interface of the OS. For example, in Windows: control Panel - Monitoring system. When you build or repair a computer without thermal paste between processor and heatsink, do not. It provides a contact of two surfaces and the cooling of the main chip. In order to apply the thermal grease on the CPU properly, do not need special skills. The main thing is your accuracy and attentiveness. First of all, we should define the purpose of thermal paste. 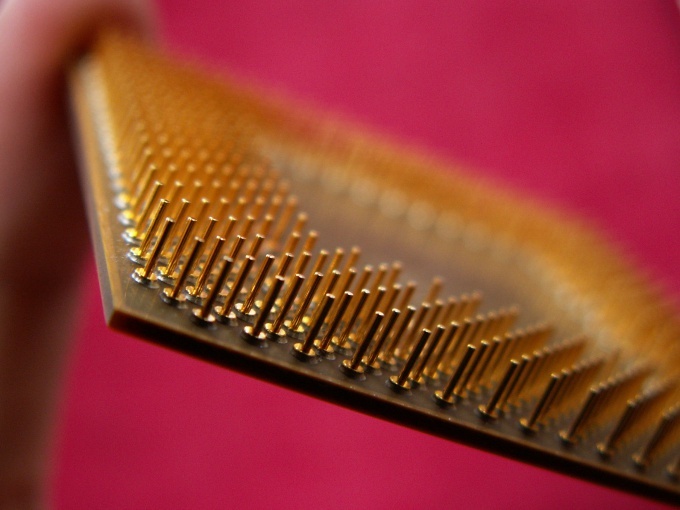 It is used to increase the thermal conductivity between the chip (processor) and heatsink. While the thermal grease has low thermal conductivity, and should be applied in a thin layer for a more intimate contact between the two parts. Thus, it maximally fills the existing airspace. Choosing the thermal compound, try to avoid the imitations of branded brands that are well established. If you put a fake on the processor, may cause overheating of the chips, and breakage. Methods of checking thermal paste, and brands that are suitable for use in computer technology, you can easily find on the Internet. To apply the thermal grease on the processor using a soft cloth clean the surface of the chip from the remnants of the old stuff. Do the same with the contacting bottom of the radiator cooler. 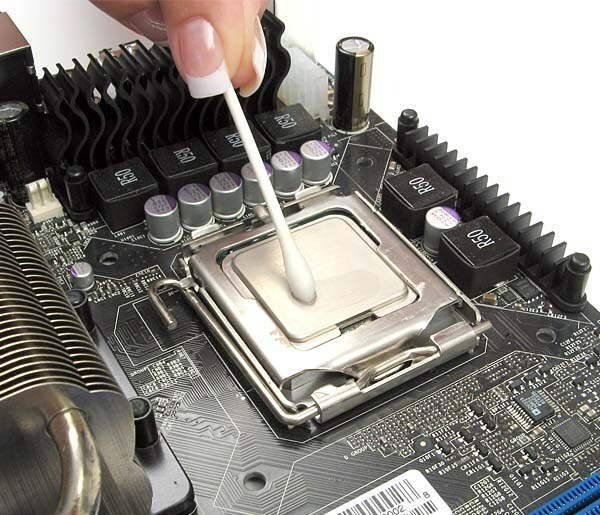 Before applying the main layer of thermal paste can be rubbed into the surface of both the so-called zero layer material, that is, after pre-coat to remove it. Thus, the thermal grease will remain in the grooves and scratches on both surfaces and provide a better contact. Squeeze a small amount of substance on the main chip. 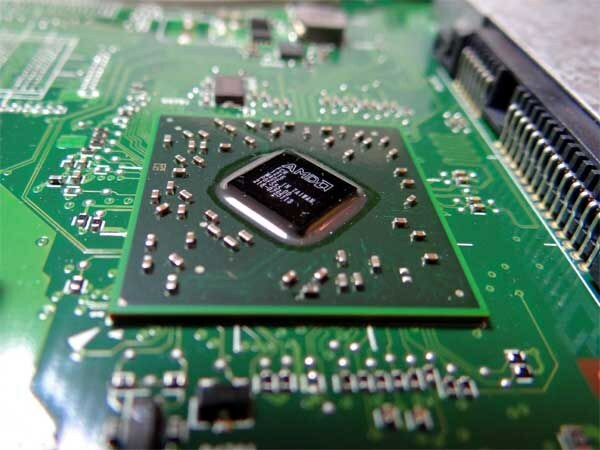 Some manufacturers suggest applying the thermal paste on the processor crosswise on the diagonal, and thereby achieve the best greasing of surfaces especially at the corners. Smear it on the CPU you need a small sturdy plate. I do not advise to do it with your fingers, but if you like more, use the rubber fingertips or gloves. The resulting layer of thermal paste on the processor should be fine. Greater amount of substance apply onto the sole of the cooler and also spread it evenly across the surface. Then tightly secure the heatsink over the processor and secure it with locks. To apply thermal paste to the CPU just. Just delete the old layer of thermal paste. The processor must be completely clean and all traces of the old thermal paste must be removed. After You clean the CPU, you can do applying thermal paste on the processor. It is a small amount more than sufficient should apply a thin layer because, as we have mentioned above, you need thermal paste to transfer heat from source to sink. 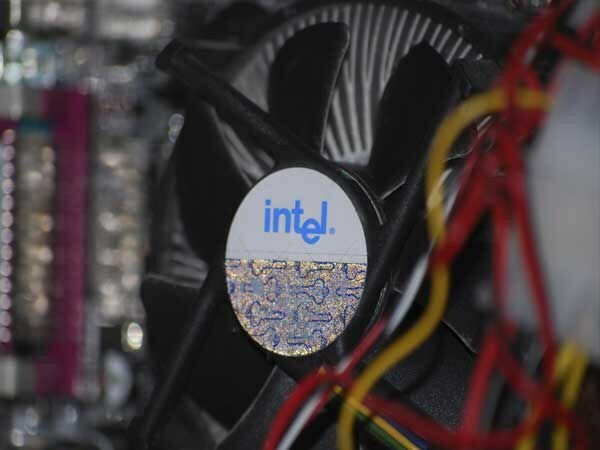 Providing the best heat transfer, it allows you to more effectively cool the processor. Owners of computers will be useful to know how to apply thermal paste yourself. The density of thermal paste possible to judge the ease of application: thicker than thermal grease, the harder it will be to apply. Pay attention to the shape of the thermal paste issue. If you are going to apply thermal paste first, select the thermal paste in a tube (syringe) - this will facilitate the dosing and application of thermal paste. Good thermal conductivity between the heat sink and microprocessor depends on the state of thermal paste. After drying it loses its valuable physical properties, and good cooling of the microprocessor is lost. To replace pasta for a start, carefully remove all fasteners and detach the CPU heatsink together with the fan. Remove the CPU by turning and lifting up the fasteners. Then clean CPU and heatsink of the remnants of the old thermal paste. Now take a flat head screwdriver, evenly spread the thermal grease on the processor chip. The layer thickness should not exceed 0.3 mm. Now install the CPU, heatsink and fan in its place and test the functionality of the computer. As for the laptop, everything is a bit more complicated. The main thing – to open the cover to get access to all the internal components of your laptop. The remaining steps are similar to the operations described above. Better tell you how to change the thermal paste on the graphics card. So, turn off the laptop, disconnect from the network and place it on a flat surface, then remove the battery (necessarily). To remove the cover, Unscrew all the bolts that are not immersed in the case. Now you have access to the "guts" of your laptop. The video card is pressed against the radiator using the four bolts. Unscrew them with your finger pry the opposite edge of the card and pull up and then pull out from the connector. Now need to remove the remnants of the old thermal paste from the chip and heatsink. First, the paste is removed from the radiator. When you are finished to remove the thermal paste, wipe the surface of the chip to a mirror Shine. Now you can start to apply new thermal paste. It can be applied to a finger (just need to wash my hands), and some kind of appropriate subject. Rubbing the paste evenly over the surface, make sure the layer of paste was smooth and thin. In addition to the chip thermal grease anywhere anymore cause don't need. Now insert back into the connector my video card. Press it and hold with your finger, then tighten the bolts in place. Tighten the bolts, put on the lid and lock it. Thermal paste is an important element of the cooling system of the computer. With it comes the best heat transfer to the cooler and heatsink that allows the fan to work more efficiently. When you replace a element of the CPU cooling is important to properly apply thermal paste to avoid overheating of the equipment. Thermal paste can be purchased in a computer store or market radios. Choosing the manufacturer please note on the conductivity of the composition, which is measured in W/m*K. Suitable for use in the processor a value of 0.7, however, the products of some manufacturers may have higher rates. Before applying thermal paste, power off the computer. Disconnect all wires leading to the device, pull the power cord. Remove the side panel of the computer by unscrewing the fastening or loosening the latch. Put it on a flat, well lit surface. Unplug the CPU. To do this you have to Unscrew some holding screws, and then open the clips that hold the cooler on the radiator. Carefully remove the cooling system, disconnect the power cord from the motherboard. Remove remnants of old thermal paste. To do this, use a soft cloth. Gently remove the applied composition, to completely clean the processor. 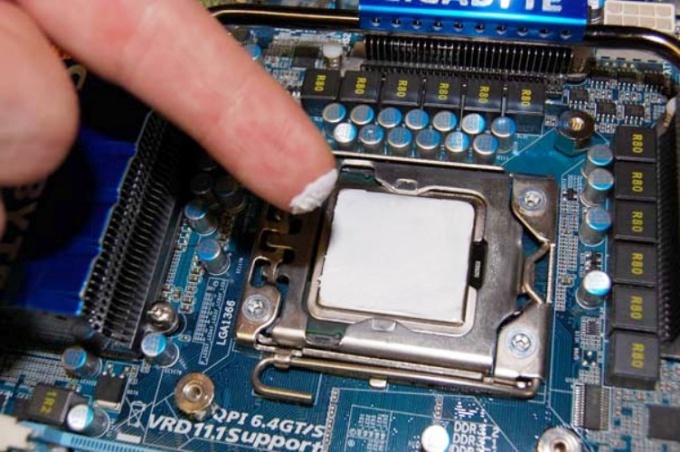 Apply new thermal grease on the surface of the processor. It is important that the layer was thin, and the distance between the cooler and the site contact minimum. If you make too thick layer may cause overheating that may cause damage to the CPU. Squeeze the composition from a tube in small portions. Try to paste randomly didn't get on the motherboard. After you complete the procedure install the cooler back on the CPU, snapping it into position desired and Wintel fastening the bolts back in. Don't forget to plug the power cord back to the motherboard. Install the side cover of the computer, and then connect it to the mains and turn on to verify. If you are not sure you can apply thermal grease, contact the service center or consult with a familiar specialist. To replace the thermal paste should only be the case if you change CPU, cooler or radiator, and when dry old pasta or as a preventive measure (every 1-2 years).